Well, i have had this stamp set for quiet a while and just not got round to working with it. i said to my daughter just let me take a couple of sweets out so i can make this card. Did just that and and then sat and did this card, have not put any words to it as will let my grandchildren send it to a friend, so will await to see if i am putting a number or just wording. I used SU Whisper White card stock on top of SU So Saffron card stock, then i stamped the machine from SU stampset called something sweet. Then i stamped real red, pink passion, olive green, chocolate chip, so saffron sweets around the machine. 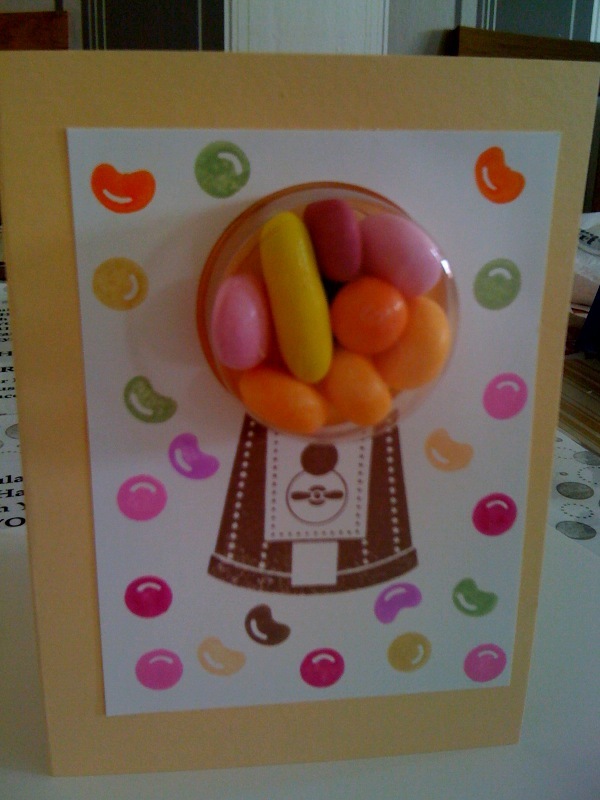 Oooh, a card that you can eat ... do they come any better!